Turkey, Syria, the USA, the EU, Gulf monarchies, Russia, Iran, and even “proto”-States like Rojava and Daesh… all these States, all States are great buddies with varying degrees of good fortune according to geostrategic circumstances and the defense of their particular national and nationalistic interests; they get along with each other at rank and file’s expense, i.e. us all, the exploited, the proletarians, the real revolutionary. Thanks .Yes, I am aware of his politics, Bastardx., although I did not know about his KLA fanhood... He 's some sort of Trotskyist., and he is way too positive about the "Syrian revolution", seeing revolutionary dynamics where others see mostly ( and realistically) jihadist dominance. Yet, he seems rather well-informed, and what he writes about the PYD here seems convincing. At the very least, there is a case to answer. It's bastarx, I assume he's still part of this weird Australian group that used to be called the Democratic Socialist Party. I'm so disinterested in the pathetic maneuvers of the Australian left that I don't know what they're called now. I think they merged with the schismatic Australian Cliffites Socialist Alternative. Apologies for the wrong name, bastarx And thanks for the information. I heard bits and pieces of this story, I didn't know Karadjis was part of that group. Did you check the article I linked to itself? What do you think of it? Does it look useful to you, even though his political connections are so dubious? There is a case to answer Karadjis, but there are several factual inaccuracies with that piece and many interpretations of his which can be challenged. Its a long piece so it'll take time to do so. Do you think the PKK should seek a ceasefire with Turkey? "In the Jazirah region, the YPG’s main Arab ally in the SDF is the al-Sanadid militia, based among the Shammar tribe (which indirectly involves the YPG in inter-tribal rivalries in the region). While the Shammar have mostly been anti-regime, there are some indications that al-Sanadid itself has had regime connections in the past. Whatever the case, it was never an FSA-connected group." The Quwat al-Sanadid militia based among the Shammar tribe has its origins in the FSA brigade Liwa Ahrar al-Jazira (LAJ)/Ahrar al-Jazeera. LAJ rose up against the Assad regime in early 2013 and held the Yaroubiya/Til Koçer border crossing from March 2013. In that struggle, they were supported by Nusra front, Ahrar ash-Sham and Ghuraba al-Sham. In mid-October 2013, LAJ was then expelled from Yaroubiya by Islamic State of Iraq and Syria (ISIS). A local delegation from Yaroubiya of Shammar approached the YPG about liberating the town from ISIS. The YPG joined with LAJ to take it back in November 2013. The distinction between Jabahat al-Nusra and ISIS doesn't appear to have been large in Yaroubiya in late 2013. Since November 2013, YPG and LAJ have shared the town. LAJ became the Jaysh al-Karama, led by Hmedi Dahham al-Hadi. In June 2014, ISIS(ISIL) threatened the Jaysh al-Karama and al-Hadi becaise of their cooperation with the YPG. In July 10, 2014, Humaydi Dahmam al-Assi al-Jarba/Hamidi Daham al-Hadi was appointed the co-governor of the Hasakah Province/Jazera canton by the Rojava autonomous administration ("after a vote"). Humaydi al-Jarba had a noted anti-government (anti-Assad) stance and was the political leader of LAJ. LAJ/Jaysh al-Karama army would eventually become Quwwat al-Sanadid. Hamid Daham al-Hadi's son Bandar al-Humaydi is the military leader of al-Sanadid. It's relationship with the YPG has only become stronger over time. Its origin, however is still with the FSA in a rebellion against the Assad regime. It can be argued whether or not LAJ was part of the FSA. That is one of the problems with the FSA. Whether a group is part of it or not seems to be as much a matter of self-identification and waving the green flag than joining some sort of coherent body that has some sort of central command or even the ability to determine its membership. Again, a minor issue about an article about Northern Aleppo, I’d like to address this point about the Kobani-Raqqa region. "In the Kobani-Raqqa region, the YPG was allied to a number of FSA groups in the defence of Kobani in late 2014, but the major local FSA group involved – the Raqqa Revolutionaries Brigade – has seriously fallen out with the YPG "
The article Karadjis links to for this point is referencing the “tribal army/clan army” that was nominally under the command of the Liwa Thuwar al-Raqqa (LTR) that changed its name and upgraded its status to Jabhat Thuwar al-Raqqa after the incorporation of a number of locals from the Tel Abyad area and points south to Ain Issa after LTR and the YPG under the banner of the Burkan al-Furat (Euphrates Volcano operations room) took the town in an offensive from both Cizre canton from the east and Kobane canton from the west. That incorporation of those new recruits did not go smoothly. There has been tension between LTR and the YPG--when a local council government for Tel Abyad was formed that declared it would affiliate with the Kobane canton, LTR claimed that Tel Abyad should remain part of some future Raqqa governorate. Ultimately, the decision for Tel Abyad to join with Kobane seems to still be in place. Another issue that probably encouraged hostility to the YPG was the displacement of 500 Arabs from the village of Abdi Koy / 'Abdi Kuy. This village is less than 10 miles west of Tel Abyad and in the general area that the Tribes/Clan army was forming. That area west of Tel Abyad was very slow to be taken by the YPG. For months, the YPG’s expansion east from Kobane was halted at Bedir Khan. When the YPG came from the east from the Cizre canton… it moved much more quickly. Advancement from the west came after Suluk was already in YPG’s hands. Upon its formation the Tribes/Clan army demanded Tel Abyad be turned over to their control and the expulsion of the YPG. It was a very tense situation as the YPG had just extended a salient across the Tishrin dam and wanted to expand from the al-Hawl offensive in to ash-Shaddadi. It got so bad there were claims of violence between the Clan Army and the YPG in Sukkariyah. It seems that the most logical conclusion to Tribes/Clan army’s disappearance almost as quickly as it created was LTR consolidating its control over its most recent recruits. LTR seemed to have decided to value its relationship with the YPG over the aspiration of some its new recruits. Some of the leadership of the Army of the Clans was “dismissed” and the new recruits better integrated into LTR. There was some debate over whether LTR had joined the Syrian Democratic Forces (QSD) when it was created in October 2015. The big meeting to establish the Syrian Democratic Assembly (MSD) to be the political wing of the Syrian Democratic forces was held December 8th, 2015. As recently as February 12, 2016 it was stated that Jabhat Thuwar al-Raqqa joined the Syrian Democratic Council and the Syrian Democratic Forces. Today, there is effectively no FSA group holding territory that is east of the Euphrates that isn’t allied with the YPG through the Syrian Democratic Forces. Early last month, Jabhat al-Thuwar clarified that it was joining the Syrian Demcoratic Forces and Syrian Democratic Assembly. There may still be tensions, but Karadjis was using this event to argue that the YPG was not allied with any FSA group. For the al-Sanadid he took the position that they were never FSA; for Jabhat Thuwar al-Raqqa he implied that they were no longer allied with the YPG. The Yekîti, BTW, were the party that was involved in the infamous YPG violence against a protest in Amunde in 2013. Yekîti are now part of the administration and participate in elections. They are supposedly the second largest party in the Afrin canton. Not only does the KDPS has a seat in the assembly, its representative Cemal Şêx Baqî is on the nine member Joint Coordination Board. Its also worth noting that Akram Hesso the prime minister of the Cizre canton was a member of the ENKS. As far back as 2003, Salih Muslim was once a member of the KDPS. We can go into a lot of contortions to say “who represents the Kurds”; but from what we see militarily, electorally and in civil society--PYD, TEV-DEM and the YPG seem to enjoy majority (if not supermajority) support among Kurds in Syria. The PYD has made no secret of their plans to link Afrin and Kobane; and to link Kobane with Cizre. People can disagree with that ambition, but the PYD has been clear in stating it. Not only have the proposed a contiguous territory but it has included Manbij, al-Bab, Azaz and even linking to Aleppo. A map in the new PYD office in Russia reaches all the way west to Jabal al-Akrad in Latakia; but stop short of coast access to the Mediterranean. 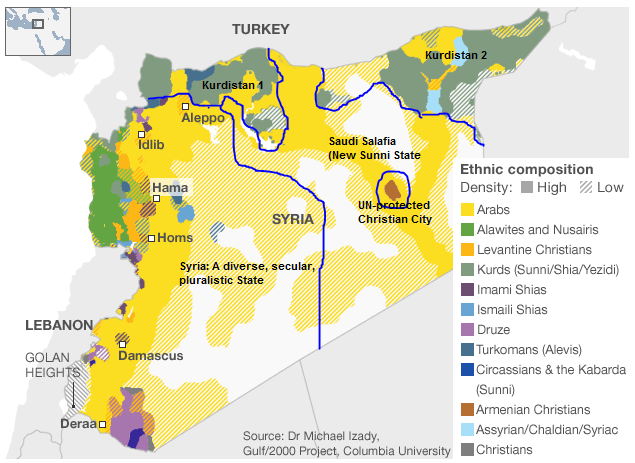 There are many ethnic demographic maps of Syria around. Izady’s is a popular one, but there are others. What the exact ethnic distribution was before the war or during may always be a mystery. Among the details being fought right now is what the demographics will be after the war. Rojava as conceived of by the PYD has always been a multi-ethnic and multi-religious polity. Much of that is a reality because of the demographics of the strongest canton--Cizre/Hasakah/Gozarto. From the formation of TEV-DEM the PYD worked with the Syriac SUP; over time it brought Shammar Arabs into its project as described above. If for the sake of argument we use Izady’s ethnic map to describe where Kurdish majorities are in northern aleppo, the gap between the Afrin area Kurds and the Kurdish majority west of Aleppo is about 16 miles. That’s without a detour to the mixed Kurdish area northeast of Aleppo or the Kurdish neighborhood of Sheikh Maqsood that is controlled by the YPG in nothern Aleppo city. The PYD/YPG certainly claims no “god-given” rights. It has been argued that the YPG has needed to secure the area between Afrin and Kobane to cut off the access of ISIS and other Salafi Jihadists to support from Turkey. A contiguous territory also would allow the YPG to easily move military assets from Cizre all the way to Afrn. Also, a connection to Sheikh Maqsood would allow the “4th canton” to not be so isolated and vulnerable. The YPG came close to uniting Afrin and Kobane cantons in October 2013. The SDF seems particularly interested in liberating the Kurdish villages under ISIS control in the Al-Shahba reservoir area; further a member of the Al-Shahba Regional Assembly is a representative in the Syrian Democratic Assembly. The Al-Shahba reservoir area is known to have been a Jabhat al-Krad area in the past. The Arab majority area between Kobane and Serê Kaniyê / Ras al-Ayn that centered on Tel Abyad (90 miles) is far greater than the distance between Al-Shahba reservoir and Deir Jamal (12 miles). Arab units of the FSA have no more god-given right to occupy Kurdish villages than Kurdish SDF units have a god-given right to occupy Arab villages. The FSA isn’t only Arab. The SDF isn’t only Kurdish. There is more to politics than ethnic and religious identity. By creating the Syrian Democratic Forces and the Syrian Democratic Forces and including various Arab groups into those organization like Liwa Thuwar al-Raqqa, the Jarabulus brigade, al-Sendadid and fighters from the Baggara and the Shaitat--the SDF has raised an expetation that it will go into Arab majority areas like Raqqa, Jarabulus, southern Hasakah and the southern Euphrates. Just as its inclusion of Jaysh al Thuwar and Jabhat al-Krad motivates the SDF in Afrin to head towards JAT/Jabhat al-Krad areas once held like the Al-Shahba reservoir area; as well as defend the areas that JAT/Jabhat al-Krad east of Maryamayn taken from ISIS in 2014. It is the PYD’s attempts to make Rojava and their “Project for a Democratic Syria” more inclusive that encourages them to expand outside of Kurdish-majority areas. History didn’t start in January 2016. This quotation makes it seem as if Deir al-Jamaal was somehow the long time home of an FSA/rebel affiliated province capital. No, Deir Jamal has traded hands a couple of times over the course of the civil war. First, its either majority Kurdish or a Kurdish-Arab mix town of four thousand people. It was taken from the Assad regime by rebels in July 2012. It was then taken by ISIS in January 2014. It was then taken by Jabhat al-Krad in summer of 2014. They held it until when it was taken by rebels including Ahrar ash-Sham/Mare Operations Room in late 2015. On February 7th, 2016, Ahrar ash-Sham and Jabhat Al-Shamiyah (Levantine Front) withdrew from Deir Jamal--then the SDF and Jaysh al-Thuwar moved in. If you use Karadjis’s irredentist argument Arab majority groups like Ahrar ash-Sham/Mare Operations Room should have never taken Deir Jamal from Jabhat al-Krad in the first place. Jabhat al-Krad didn’t displace rebels in January 2014--ISIS did. If the Aleppo Province Council was setup after that, it could of only been in late 2015; because SDF is once again controls security in the town in February 2016. archicivilians claims the destruction in the Provincial Council of Aleppo in Deir Jamal town, due to Russia’s airstrike on November 28, 2015--not from SDF/JAT/YPG attack. Turkey, BTW, has been shelling Deir Jamal since SDF moved in; presumably Yassin-Kassab has no objections--does Karadjis? A series of towns and villages east of Maryamayn were liberated by Jabhat al-Krad/YPG/Jaysh al-Thuwar from ISIS in the summer of 2013 including: Shawarighat al-Arz, Tatmarash / Mrash, Tanab, Kishtaar, Ibbīn and Alqamiyeh. It was the “rebels” that had attacked Jaysh al-Thuwar positions there in late 2015 having temporarily secured many of them as of December 1st, 2015. Then by January, JAT had started to take them back. When then SAA linked up with Nubl and Al-Zahraa; the SDF/JAT were able to definitely secure these villages and move onto the areas that rebels had staged attacks from like the Menagh air base and Tell Rifaat. Maryamayn has been the headquarters for Jaysh al-Thuwar. The rebels involved with taking those villages east of Maryamayn were organized as the Mare Operations Room. As recently as November 23rd, 2014… the Mare Operations Room did not control these villages. Take note, the Russian airstrikes began in September 30th 2015, with air strikes in the Aleppo area by mid-October. That means that the Mare Operations Room began its most recent offensive against the JAT villages east of Maryamayn AFTER Russia had already begun its air strikes in Aleppo. While the Mare Operations Room was ostensibly setup in August 2014 with 800 members of Islamic Front joining the FSA to defend Mare from falling to ISIS who were besieging it from the east, the Mare Operations Room seems to have devoted a lot of resources in November 2015 to taking Jabhat al-Krad/Jaysah al-Thuwar villages to their west to widen the supply corridor from Azaz to Aleppo. So with fighting after the 48 hour deadline expired, Mare Operations Room did take those villages; but then there was sporadic fighting with JAT/SDF all winter over control of these villages until the fighitng definitively ended with a JAT/SDF victory in February 2016. The Mare Operations Room attacks on JAT villages was just the latest in a long list of attacks on JAT and the YPG throughout northern Aleppo over the years. Who is in the Mare Operations Room is a good question? Falcons of Mount Zawiya Brigade (Fuqour al-Jabal Brigade), Sham Legion, Northern Division, Jaysh al-Tahrir and allegedly Jabhat al-Nusra Front and Ahrar ash-Sham. As recently as February 2016 it may have inlcuded Liwa almutassem, Levant front, Safwa islamiya, Quwa almarkaziya, Ossood alTawheed, Ahar ash-Sham and Abu Walid group, The SDF/JAT were supposedly in negotiations for the Mare Operation Room groups to withdraw from Mare leaving only the Abu Walid group to share the town with the SDF/JAT--all without a single shot being fired. That diplomatic attempt appears to have failed and the SDF/JAT did not enter Mare. During the fighting in February atleast one US manufactured TOW missile was used by a rebel group west of Mare to destroy an SDF/JAT vehicle. This is around the time that there were articles about how U.S. backed rebel groups were fighting each other in northern Aleppo. For years, Jabhat al-Nusra, Ahrar ash Sham and their allies have attacked YPG/Jabhat al-Krad/Jaysh al Thuwar in the Afrin canton and Sheikh Maqsood neighborhood in Aleppo. Just google it and you come up with story after story about it as well as accusations of kidnappings, mistreatment of civilians, breaches of truces and ceasefires, bloodshed around checkpoints, etc… the Mare Operations Room attack on villages east of Maryamayn in November/December 2015 particularly along route 65 seem to have been the last straw for JAT and the Afrin YPG to finally launch an offensive towards Mare in January/February 2016. Now after years of conflict, some FSA supporters who seem quite willing to tolerate alliance of the FSA with Salafi Jihadists are now screaming about how the PYD has betrayed the revolution. Karadjis doesn’t mention any of this and continues to downplay the role of Nusra, Ahrar ash-Sham and other Salafi Jihadhists role in Northern Aleppo. If it is not Nusra and Ahrar ash-Sham attacking JAT and the YPG in northern Aleppo--then who is? SDF/JAT/YPG took Menagh Air Base after three days of fighting. SDF/JAT/YPG took Tel Rifaat in a day--which either means a withdraw of the rebels there or a complete collapse of their defenses (under the pressure of Russian bombing). SAA had also been advancing on Tel Rifaat, but the YPG got their first and blocked the road to prevent the SAA’s progress. Turkey then started shelling Tel Rifaat. The SDF/JAT/YPG advance in Northern Aleppo as far east as Ahras towards ISIS front lines is accomplished and with the cease fire, their position is solidifying. The road between Azaz and Aleppo city is blocked both by the SDF/JAT/YPG line from Deir Jamal to Ahras; and south of there from Nubl to Tell Jabin. Even if rebels conquered the villages along the Deir Jamal-Ahras line, negotiated their turn over, or got an agreement of free passage, they would still be blocked by the SAA having linked up with Nubl. However, as long as the SDF/JAT/YPG holds the Deir Jamal to Ahras line, the SAA can not advance on the remaining rebels in Mare and the Azaz pocket unless they are willing to fight the SDF/JAT/YPG. If the Mare Operations Room was capable of stopping the SAA’s progress in Northern Aleppo, they should have done so to prevent the link with Nubl--instead their defenses of Tel Rifaat collapsed in a day. The Czech Republic has supported the Kurds in their fight against Daesh militants, including supplying weapons and ammunition. Everything as I wrote before: "But the main thing is the weakness of Russian imperialism...."
The Kurds in Rojava formed an Alliance with Russian imperialism and hoped for his support. In recent days, two things happened. First, according to the latest reports from the Kurds, Americans have reduced or even stopped military support of Rojava. Instead, they Fund groups of supporters of Barzani who are fighting against supporters of Rajava in the district of Afrin. Secondly, Russia under pressure from the U.S. withdraws troops from Syria. Yesterday's unexpected decision of the Kremlin about the withdrawal of troops is connected with new sanctions that were adopted yesterday in the United States and the European Union. The Kurds relied on the support of the weak Russian imperialism. This can lead to their defeat. Thanks for researching and explaining all that Flint, I've not had time to deal with the complexity of the current situation but what you write makes a lot of sense out of it. There was a big falling out between Jabhat al-Nusra and Division 13 around Idlib, Ma'rat al-Nu'man and north of Hama recently. JAN basically annihilated Division 13, as it has done with other FSA groups that have opposed them. Now the issue is going to be sorted out by Sharia court with JAN suggesting the judges. First, according to the latest reports from the Kurds, Americans have reduced or even stopped military support of Rojava. What reports are you using? Liwa Ahfad Sallahudeen claimed this. They are perhaps not the best source to trust. I hear reports that the SDF still have U.S. support in Hasakah and that the U.S. will likely be helping with the push towards Manbij. We can all post rumors. It is better to post sources. Instead, they Fund groups of supporters of Barzani who are fighting against supporters of Rajava in the district of Afrin. I assume you are referring to Liwa Ahfad Sallahudeen. They have fought with the YPG in the past, but right now they are fighting ISIS. They took the village of Doudyan / Dudyan about fifteen miles to the east of A'zaz. They are not currently fighting the YPG. They had a crew at demonstrations in Mare' recently where they threatened to fight the YPG if they entered Mare. SInce then, Mare came under attack by ISIS (not by YPG/SDF, which was trying to negotiate the surrender of Mare without violence). They say they follow Barzani, but they aren't the Rojava Peshmerga or seemingly affiliated with KDPS. They are a relatively small outfit that is holding one village and is isolated in the Azaz pocket. They are by no means comparable to the YPG/SDF. Secondly, Russia under pressure from the U.S. withdraws troops from Syria. Yesterday's unexpected decision of the Kremlin about the withdrawal of troops is connected with new sanctions that were adopted yesterday in the United States and the European Union. The Kurds relied on the support of the weak Russian imperialism. This can lead to their defeat. TEV-DEM and the PYD claim otherwise. See the above article I linked for Andrew. What? Putin officially announced that Russia leaves Syria. And the fact that sanctions cause painful damage to the Russian economy there is a widely known fact. I think you should not talk about things you don't know. TEV-DEM and the PYD claim otherwise. What?? They opened in the Russian Federation a representative office, and their cooperation with Russia is on a formal nature. http://kurd.press/?p=19610 This is the official Kurdish website. In other words, while the PKK says that the United States ceased to help them you are sure that, on the contrary, the U.S. continues to help PKK\PYD\YPG? Contrariwise, PYD operations were continuing with U.S air support just two days ago. Maybe the US did not stopped air support, and only reduced the supply of weapons who knows. You are talking about things you don't know. You are speculating on why Russia withdrew its ground troops. That they have said they will is something they publicized. They also have an office in Czech Republic. Anyway, the article I posted quoting folks from TEV-DEM and PYD is clear enough. You can chose not to believe them. This is the official Kurdish website. There are many Kurdish websites and many official websites for many organizations. This one does seem to be a pro-PKK Russian site. I would encourage you to read more sources than just this one and just in Russian. The article in question discusses Liwa Ahfad Sallahudeen, as I previously mentioned. The claim that Liwa Ahfad Sallahudeen that the U.S. no longer supports the YPG should not be taken seriously. Its is merely rhetoric. Folks can speculate wildly who is funding the Liwa Ahfad Sallahudeen. Could be Barzani (the KRG is technically broke), could be Erdogan, could be Saudi Arabia, etc... It wouldn't even be that strange for the U.S. to do so given its long history of supporting Islamists. But at the moment, we just don't know. The article does mention their size as 600 (which may even be generous). Speculation on the size of the Syrian Democratic Forces including the YPG is anywhere between 30,000 and 80,000. The U.S. was never aiding the PKK. While you might want to regard the PKK and PYD as inter-changeable, the U.S. has taken great pains to say they only secondarily aid the YPG and that they are not assisting the PKK. However, the U.S. also doesn't attack the PKK directly in Iraq either. Though it is the principle arms supplier to Turkey. The U.S. was aiding the SDF(QSD) and through it the YPG. It is still doing so. Primarily through air strikes. There is evidence to suggest ammunition and even a special operations unit operating an anti-tank weapon. PYD and YPG folks meet with the U.S. in the U.S. and U.S. officials meet with PYD/YPG/SDF folks in Rojava. I think we need only wait for the next SDF offensive to see. 1. I asked a direct question to an official representative of the Syrian Kurdistan. What is going on with the aid to the Kurds by the US is it stoped now or not? He said that the aid is not stopped, the relationships are complex and multifaceted... We'll see. 2. You are talking about things you don't know. This is a very primitive level of communication that you demonstrate. There were only two reasons for Russian intervention in Syria - the PR of the Kremlin inside Russia (what is here called "the Battle of the TV and Refrigerator") and the attempt to convert the operation in Syria to lifting sanctions. But opinion polls show that the population does not feel sympathy for the war in Syria. As for the sanctions they are only not abolished, but has introduced new ones a few days ago. Therefore, the war in Syria has lost its meaning for Russia.